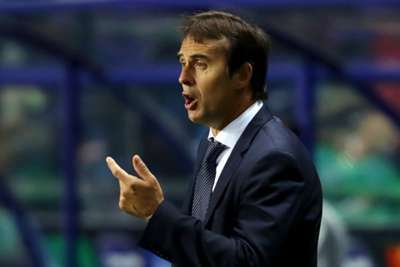 Julen Lopetegui says losing to Atletico Madrid in the UEFA Super Cup does not mean Real Madrid will decide to sign new players. The former Spain head coach saw his new club downed 4-2 in Tallinn on Wednesday, Diego Costa's double and extra-time goals from Saul Niguez and Koke securing Atletico a famous win over their Madrid rivals. Champions League winners Madrid have lost talisman Cristiano Ronaldo to Serie A titleholders Juventus and Luka Modric has also been linked with a move to Italy – Inter coach Luciano Spalletti confirming their interest in the World Cup Golden Ball winner. Although traditionally among Europe's biggest spenders, Madrid have had a quiet transfer market despite being linked to stars including Eden Hazard, Mauro Icardi and Robert Lewandowski. No Ronaldo replacement appears imminent at the Santiago Bernabeu and Lopetegui indicated there will be no panic buys after Atletico's victory in Estonia's capital. "What was outlined by the club's sports policy does not change by this final," Lopetegui said to Movistar. "Now LaLiga starts, which is a very important title for me, and we have to start well. "We were playing well in extra time, we are dominating, combining, playing together, with good feelings, and after 3-2 the game has changed, problems have appeared and we have looked for solutions with risky decisions. "In a final the difference is marked by mistakes that can be taken advantage of and Atletico are experts in that. They have punished us and we have to congratulate them because they have won deservedly." Diego Simeone's seventh title ensures the Argentinean is now the most successful coach in Atletico's history, eclipsing Luis Aragones. But Simeone is already focused on the start of the LaLiga season, with Atletico in action at Valencia on Monday. "Today we have to enjoy, no doubt - when we have to lose, we suffer, we cry, we get angry, we lock ourselves in," Simeone told Movistar. "From tomorrow night we will start thinking about the league, which is going to be a very hard season. "More titles this season? Everyone knows me: Valencia." Shadab Khan's World Cup place is in jeopardy after a virus ruled him out of Pakistan's limited-overs internationals against England.